A while back we ran into some of the guys at Bad Robot. We liked the stuff they were making, they liked the stuff we were up to, and we hit it off almost instantly. After we'd given them a tour, one of the things they found the most fascinating was TF2's ongoing update schedule. Traditionally a film and TV studio, they typically don't get to show their community anything until it's already finished. So the idea of shipping a beta version of something, then working with a community of gamers to make it better over time, was a wholly new and exciting concept to them. Flash forward a bit, and here we are: The TF team is incredibly happy to announce PASS Time, a new game mode for Team Fortress 2 dreamed up by Bad Robot and co-developed with the talented folks at Escalation Studios, available now in-game as a beta release. 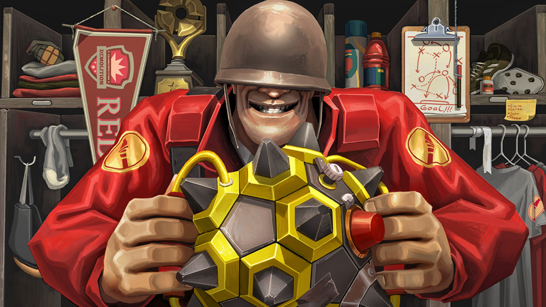 PASS Time combines TF2's usual fast-paced bloodsport with the actual fast-paced sports of soccer, hockey and basketball. This is where you come in. PASS Time marks Bad Robot's first foray into rapidly iterative content, and they're really excited to get feedback on their beta so they can work with the TF community to evolve the game. This is a new way of doing things for them, and they're looking forward to working with you to see how it grows over time. Keep reading for more information about the new game mode—or just boot up TF2 and play it for yourself. Take it away, Bad Robot! Thanks, guys. And hello to the TF2 community! As massive fans of all things Valve and TF2, we've been thrilled to work with them, and the deft developers at Escalation Studios, to present this super early look at PASS Time. And now we're extremely excited to have the opportunity to collaborate with you, the players! Your feedback will be critical to making this mode, at very least, worthy of the game we all love. So, many thanks for hitting us up at passtime@valvesoftware.com with any and all thoughts. Here's hoping that, together, we can create something special that the community will enjoy as much as we've enjoyed just getting to this point! RED and BLU face off in an epic battle to score more goals than their opponents. Coordinated passing, aerial shots, interceptions, team-based formations and plays, defensive lines and the like make for strategically chaotic play. A critical aspect of PASS Time play. Team-based passing is a surefire way to get the ball away from your goal, and into your opponents', as quickly as possible. In PASS Time, it’s vital to play as a team. Lone wolf runs don’t stand a chance against a united front. PASS Time introduces speed boosts and jump-pads. Nothing beats the rush of a mid-air shot-on-goal or interception. A balance of offensive and defensive strategy is key. Goalies can be the difference-makers in PASS Time. As with most sports, try not to die. Especially if the match ends in a tie—'cause that’s when true Sudden Death kicks in.